Finatics has a large fleet of Inshore Bay Boats that fit whatever needs your group may have. We even offer multiple boats to accommodate larger groups. Our Dauphin Island inshore fishing charters include everything from the backwater marshes and rivers to Mobile Bay. We may even go out as far as 3 miles off the beach. From late Fall to early Spring, we typlically fish in the rivers surrounding Mobile Bay and the Mobile Delta. For our inshore trips, FinAtics Fishing Charters will take you out aboard a brand-new 2019 26’ Avenger center console. It comes powered by a 300 HP Yamaha engine and provides comfortable fishing space for up to six anglers. The boat is stable and is outfitted with top-notch navigational and fish finding electronics, as well as other professional tools and accessories to save your time while searching for fish. All trips come with a license, rods, reels, tackle, bait, lures, as well as a complimentary fish cleaning at the end of the adventure. Check out our recipes too so that you can enjoy your catches at home. If you want to catch fish with a fly, you will need to bring your own equipment. We ask that you bring whatever you would like to eat and drink, as well as your Sunglasses, Hats, Camera and plenty of sunscreen. An onboard cooler with ice will be provided to hold and chill your drinks. After everything is put away and secure, your captain will conduct a quick safety meeting. You will be shown where the life jackets and fire extinguisher are located as well as how to operate each piece of safety equipment. At this point, it’s time to push off the dock and the FUN begins. 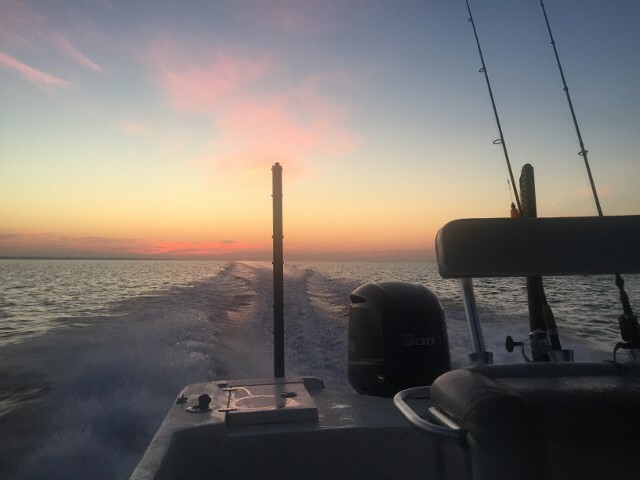 We will be targeting Speckled Trout, Bass, Redfish, Sheepshead, Spanish Mackerel, and sometimes King Mackerel depending on how close they are to the shore. For several years running, Finatics has been the #1 rated Dauphin Island Inshore Fishing Charter on Trip Advisor and we can’t thank our customers enough for helping us get there with their kind words.